Spring 2015 | Racing Hearts - Helping to save lives with AEDs. We're springing through 2015 nicely. Racing Hearts truly believes that one can accomplish so much more with collaboration with our community partners. We are most excited to share that conversations with our local representatives have resulted in CA State Senator Jerry Hill being a champion for our mission. Senate Bill (SB658) not only would update Title 22 (aka law regulating AEDs) it would bring the standard of care here in CA more accurately in line with what our Government feels about AEDs. Per the NIH website, "Learning how to use an AED and taking a CPR course are helpful. However, if trained personnel aren't available, untrained people also can use an AED to help save someone's life." Whether the bill moves forward or not, we are so incredibly thrilled to be having this discussion. 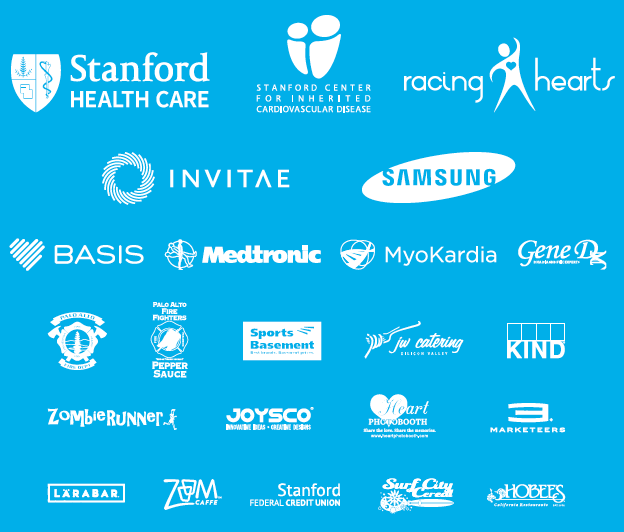 This past quarter, we partnered with Stanford Hospital to produce our second annual Racing Hearts 5K/10K race. With 600 walkers and runners, along with 200 volunteers, we celebrated active living with heart disease in support of the cardiovascular team at Stanford and community AEDs. Thank you again to all our partners. Our AED lending program continues to help local athletic events by increasing the heart safety of the participants. To date we have participated in over 47 events with a total impact of over 160,000 people. As we continue to move forward and place new AEDs in our community, we want to say thank you because although we are passionate about our mission, it really is more fun doing this work with you. To join us click here.